It’s impossible to compartmentalize the finale of Aquaman. The imagery involves a kraken out of Pacific Rim, submarines, crab people, merepeople, fish people, laser beams, swords, sharks, sea horses, and two guys who really, really hate each other. Aquaman produces a bonkers, kaleidoscopic surrealist interpretation of… everything: kitchen sink, visual effects filmmaking. For 140-minutes, Aquaman never really stops. Every earnest bit of conversing is interrupted by explosions, to a point of comedy and repetition. Hardly any dialog exists except exposition because Aquaman doesn’t have any time between the litany of splashy, enthusiastic kookiness. It’s as if a ‘70s sci-fi TV show were given the budget (and tech) to produce their most ludicrous stories. Consider that Jason Momoa – Aquaman – never builds an actual character. He has the typical arc of “I can’t do this” before “I’m the all-powerful fish god man of good.” Fill in the blanks. He spends most of the movie with a smug, cocky, immature look, popular in modern superhero-dom. Momoa earns it though with an imposing figure. Of the recent superhero blitz, none come close to the sheer hollowness of Aquaman. Between the brawling, Aquaman lures in a story of ocean pollution. “We’ve got some idiots in charge,” spouts Momoa when faced with a landfill’s worth of plastic bags left ashore after a tsunami. In one line, Nicole Kidman (Aquaman’s mother) explains the difference between a king and a hero – a king rules over one nation, a hero over all. Inspiring against nationalism, and if Aquaman had any inkling of being anything else beside spectacle, there’s the jumping point. But no. More explosions incoming. Aquaman never aims to surprise, just entertain. Endlessly entertain. The few plot twists foreshadow themselves, a romance between Momoa and co-star Amber Heard is every bit the derivative placeholder, and of course Momoa will take over the undersea kingdom in the end. He’ll do so riding on a 200-foot tall sea monster, because seahorses don’t pair with this vision of the character. Most of the runtime is spent with actors floating in artificial water (with ersatz CG hair). This is that rare instance where the creakiness of imperfect digital compositing works. Nothing in Aquaman needs to look real, rather celebrate the brazenness of comic book storytelling. DC’s other outings focused on putting superheroes on real world grounding; Aquaman wants none of it. Off on its own Aquaman goes, breaking from the cold, morose shell set by Zack Snyder, becoming its own exuberant self even as it takes from every other origin and hero story ever told. Ignore the mountain of noise in the opening action scene. It’s rough. The darkened submarine interior plays host to excessive digital artifacts, a sign of a not-so-great encode. However, with some 80+ GB provided to the movie file alone, this is hardly a problem of compression, rather the digital source. Besides, what’s to come is all kinds of marvelous. Sure, Aquaman doesn’t sport the greatest in texture or detail. A 2K source, Aquaman looks it. Given the number of visual effect shots (pretty much every shot) shooting in 4K makes little sense. Plus, the watery haze further, by design, saps some sharpness for style points. In that, Aquaman is gorgeous. Then comes the color. Underwater, this is a saintly disc, giving and giving via a surge of vivid, masterfully saturated action scenes. Better still, Aquaman glows. With the aid of Dolby Vision, this light show dominates in terms of sizzle. Every shot in Atlantis evokes a special kind of contrast. Costumes sparkle, lasers bloom, jellyfish glimmer, and explosions pop. This is super intense stuff, reference grade in terms of live action color, ignoring that so little of this is actually live. To counter, black levels reach flawless depths. Shadows have punch. There’s no loss of fidelity to their cause. Underwater, that impact is lessened by way of the scenery. Kudos to the encode for avoiding instances of banding when the haze calls for it. While others earn perfect ratings for sharpness and detail, Aquaman does so purely on the splendor of its color. Do note the switching aspect ratio. For most of its runtime, Aquaman employs IMAX’s 1.77:1. Once past the opening chapter, 2.35:1 is used sparingly. While not as precise as the UHD, those sticking to Blu-ray lose little. Some banding comes into play during hazier gradients. Noise sticks out as a little more prominent too. The key qualities to Aquaman remain. That color, terrific and bold, is at its richest for this format. Heavy action loses nothing in the move to 1080p. Deep black levels avoid any major crush, and peak contrast is reliable. Both discs use Dolby Atmos, but default to DTS-HD. Why the default and why Warner chooses to pay for licensing from two different makers is something only corporate America is likely to understand. Regardless of the choice, this is as bombastic as audio mixes come. For sheer consistency – given how few films feature this much action – the subwoofer never stops. Dynamic range is reference tier from the opening scene with a submarine raid punching up machine gun fire and once Momoa jumps in, his punches too. Storm sequences push grade-A LFE, and by the time Aquaman is staging a full war, the kraken breaks out and creates bass practically unmatched. The only other disc even close in the quantity of subwoofer output is Pacific Rim. Aquaman features more. Being in the ocean, this invites an equally constant ambiance. Water rushes all over. Aquaman won’t lose anything to its mammoth range. Even subtle motions find placement in the rears or stereos. Sloshy waves make for awesome positional work. Some seagulls caw in the rears a few times too. Major action tracks all manner of fish, clashing tridents, and voices. Aquaman won’t miss a cue. As is the norm, the Blu-ray holds the extras. 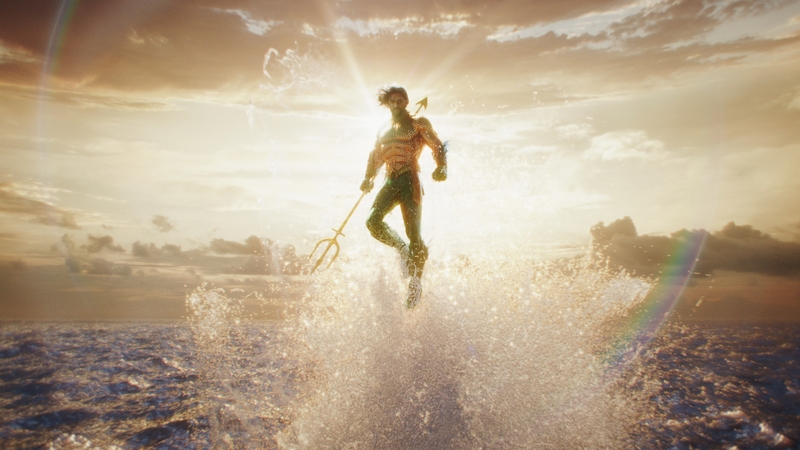 They start off well with Becoming Aquaman, a great look at the process of bringing Momoa into the role, spending 13-minutes with the actor and director James Wan. Going Deep into the World of Aquaman continues at the same tier, a little under 20-minutes. Production values reach an unusually high tier for a new release, even if they hide a fairly generic making-of. The rest? Meh. Each major cast member is given their own featurette, a few minutes each. A far too brief look at the final battle only lasts five minutes when spectacle deserves more. Two more shorts focus on creating the creatures and technology. Some scene breakdowns show how much of this movie was created digitally. Finally, Dolph Lundgren hosts a feature on the seven kingdoms of Atlantis, which is better in terms of detail than the movie itself (and this is only seven minutes). Forget depth and basic character development. Aquaman adores spectacle, so much so there’s not enough time to focus on the faults.